Scott Fenwick admits his first stint playing in the Football League has been the most “stressful” period of his fledgling career. The striker feared his dream move was going to become a nightmare with Hartlepool United battling against the drop for most of the season. It was such a relief as I didn’t want it to be a five-minute spell playing at this level. But there was a fairytale ending as Pools managed to get out of danger with a game to spare, leaving Fenwick to reflect on a campaign that had “everything”.. The 25-year-old finished the season as the club’s top scorer in the league and after Pools took up the option on his contract, he is raring to go again come August. “My first season as a pro has had everything,” Gateshead-born Fenwick told SportMail. “It has also been the most stressful period of time I have had in football – no question. “It was a massive bonus to come here and score goals but the reality of coming in when the mood was down and we were losing every week was tough. “That has gone now, and it doesn’t even feel like we were in a relegation battle. “It almost felt like a promotion when we stayed up and we are all now looking forward to the new season. “It was unbelievable, we are still in League Two and staying here. Fenwick came to the attention of club scouts last November after another impressive scoring run with Ebac Northern League side Dunston UTS, notching 15 goals. Having joined League Two Pools, the former civil engineer admits he was taken aback by how quiet the dressing room was, with morale and confidence rock-bottom as the club propped up the rest of the league. 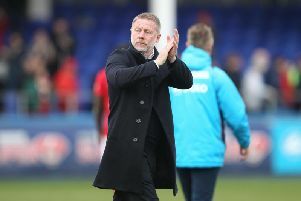 Boss Ronnie Moore was keen to see his players enjoying their football again and Fenwick wants his teammates to take the atmosphere from the final week of the season into the new campaign. “Towards the end of the season, once we knew we were safe, the lads were laughing and carrying on and the manager said we need to enjoy being footballers again,” added Fenwick. “Before, we were coming in on the Monday after getting beat on the Saturday every week and it was tough. * Former Hartlepool United loanee Marvin Morgan has signed for Havant and Waterlooville after being released from League Two side Plymouth Argyle. The 6ft 4” striker joined Ronnie Moore’s Pools at the end of January but made just four appearances, scoring one goal before falling out of favour.